Please join us for Fellowship Time each Sunday after the 10:00 AM worship service. You will be able to enjoy friendly conversation and light refreshments. Visitors are welcome and encouraged to join us for this time of fellowship. You will have the opportunity to meet people from the congregation and learn more about the DeBows community of faith. Also, for months having 5 Sundays, we celebrate the 5th Sunday with a Covered Dish Luncheon during Fellowship Time. If members of the congregation wish to host a fellowship time, please sign up for a specific week at the sign-up table located outside of Fellowship Hall. This ministry is made possible by the donations received during Fellowship Time and the people who volunteer to host each week. The DeBows Pathfinders Group held its inaugural hiking event on Saturday, October 7th. They went to Monmouth Battlefield State Park. It was a very enjoyable early fall hike, albeit a tad warmer than one might expect in October. Nine people participated in this event and everyone is welcome to come along on the next event. The current plan is to schedule one event monthly. The events will include hikes and nature walks, which will be open to all age groups. So, watch the church calendar for the days and locations of future events. The next hiking event is tentatively scheduled for Saturday, November 4th in the Sourland Mountain Preserve, near Hopewell, NJ. More specifics about time and gathering location will be posted in the near future. Watch the video below to see some of the pictures taken on the October hike. Our resident trail-guides, Wayne and Peggy Ervin, will kick-start our new hiking small group by taking us on an adventure in Monmouth Battlefield State Park. Come join us as we enjoy the early fall weather and the changing season! 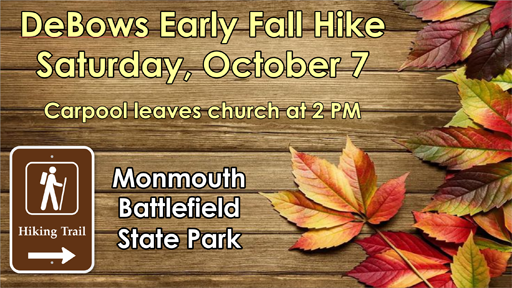 The date is Saturday, October 7th for our first hike as a church. People interested in this activity should meet at the church at 2:00pm, and from there we will carpool over to Monmouth Battlefield State Park. Restrooms are available in the visitor’s center. The actual hike will start about 3:00pm and will be about 3 miles in length. Sunday, October 8th after church will be the rain date. This will be an active group and future events will be scheduled. Events will include a variety of nature walks and hikes that are open to family members of all ages. So, find a comfortable pair of walking shoes and join us as we explore God’s creation and gets some exercise. Be ready to experience nature and don’t forget to bring your camera and a bottle of water. After each worship service there will be a Fellowship Time in Fellowship Hall. Visitors are welcome and encouraged to attend Fellowship Time to learn more about our church family and community of faith. Light refreshments are served each week.